We’ve tackled quite a few Instant Pot recipes in the first few weeks since I opened this little beauty that was tightly wrapped up under our Christmas tree. While we are still learning about the Instant Pot and all that it is capable of doing, the one thing we had not tried yet was a beef roast, until last night. The biggest take away that we learned from this Instant Pot recipe is that for a beef roast, pressure cooking time is more dependent on thickness than weight. We found an excellent resource that discusses and compares pressure cooking times for various times for a beef roast and used their recommendations as a guide for this recipe. As we learned with our whole chicken pressure cooker recipe for the Instant Pot, the resulting juices make for an excellent gravy and we opted to use them for this Instant Pot rump roast as well. I picked up the ingredients for this entire Instant Pot dinner at Aldi and probably spent a little more than $15.00, which handily would feed a family of 4 or more people. I’m learning to steam vegetables and make mashed potatoes in the Instant Pot and once I perfect my technique I will share it with you, I promise. On a side note, have you ever eaten or cooked with rainbow carrots? They’re one of my favorite finds from our local little farmers market a few years ago and we have cooked with them many times since, including with this very popular pork recipe from Platter Talk. The Instant Pot is a relatively new kitchen appliance and there is a learning curve to it but don’t let that stop you from having fun with it. You’re going to have a flop or two, but that’s OK! Don’t get too frustrated and for goodness sake don’t be afraid of the Instant Pot. Pick up a nice chunk of beef, grab some seasoning and then have some fun. It’s going to be delicious! This Instant Pot Dinner features a rump roast pressure cooker recipe that is deliciously satisfying and leaves plenty of pocket change for dessert. Place roast in large mixing bowl and generously sprinkle all sides with kosher salt and pepper. Next, evenly cover all sides with brown sugar. Allow to rest while preparing Instant Pot. Place olive oil in Instant Pot and turn to sautée (high). Once the Instant Pot is fully heated, ensure that olive oil is evenly distribute throughout bottom surface of pot and sear each side of the roast for 4 to 5 minutes, using a set of large kitchen tongs to handle the meat. After all sides of roast are seared, turn Instant Pot to off and add broth. Be sure that the level of broth reaches at least one half the height of the roast. Close Instant Pot and place vent valve in "sealing" position. Use manual setting (high) and set for 70 minutes. (See recipe note regarding cooking time). At conclusion of cooking cycle, allow for a natural release (NR) of pressure. Carefully remove roast and juices, place both in large bowl and tent with foil while you make the gravy. Turn Instant Pot to off position. Turn Instant Pot to sauté function., medium setting. Add butter to pot and when that is melted, stir in and sauté the mushrooms until soft. Use a hand held fine mesh strainer and sprinkle flour onto mushrooms and butter, while stirring constantly and until a paste forms. Increase sauté heat to high (you may need to turn it off first) and gradually add 1 to 2 cups of reserved juices. Adjust flour to juice ration for desired consistency. Add salt and pepper to taste. Serve beef and top with gravy. Pressure cooking time for a beef roast is determined by thickness and not weight. As a general guideline, figure on 20 minutes for each inch of thickness. If you have a roast that is more than 3 inches thick, add another 10 or 15 minutes to the cooking time. Remember, allow for a natural release when pressure cooking a roast and always let it set for at least 10 minutes (outside of the cooker) so that the meat fibers can reabsorb the juices. If you like this recipe, be sure and visit our big sister site, it’s full of hundreds of delicious recipes! Would time change if the rump roast is frozen? Certain cuts of meat such as chicken legs can be frozen when cooked in the Instant Pot. Thicker cuts such as roasts are much thicker and the increased thicknes along with their frozen condition necessitate a much loooonger cooking time and therefore we do not recommend making frozen roasts in the Instant Pot. Did you cook the carrots with the roast or after roast is removed, before gravy? Hi Anne. Cook the carrots with the rost (from the beginning) and then make the gravy as directed. Thanks for the question! Just made this. SUPER yummy! Husband said it was the best beef he’s eaten in years. Thanks for the recipe! Thanks for the feedback, Christina! We’re so happy you enjoyed this one. Hi – I want to make this recipe but could only find 2lb roasts so I bought 2. Do you think its possible to do this recipe with just under 4lbs of meat? And the roasts have fat caps, do you trim those? Also the roasts are about 2 inches thick. Thank you in advance. Hello and I apologize for the delayed response. You can do this with under four pounds of meat and I would trim the fat caps after they are cooked, for added flavor. I have a bag of frozen vegetables and some regular cut up potatoes I would like to cook with the roast. Would you recommend I put them in the IP with the roast from the beginning? Sorry for the delayed response. Add them at the end! Just a reminder that if you live at higher altitude, you must use the Instant Pot table as the higher you go, the longer the cooking time. Happily, my Ultra 6Qt. has an adjustment to altitude. I am going to make this roast tonight. I don’t have beef broth on hand and hate to make a special trip to the store. Could I use a can of beef gravy and add water to it? Absolutely! Let us know how it turns out. Boil some beef broth. Remove a little bit of broth and add corn starch; mix well. Gradually mix it the boiling mixture. Don’t forget to stir; it may stick. 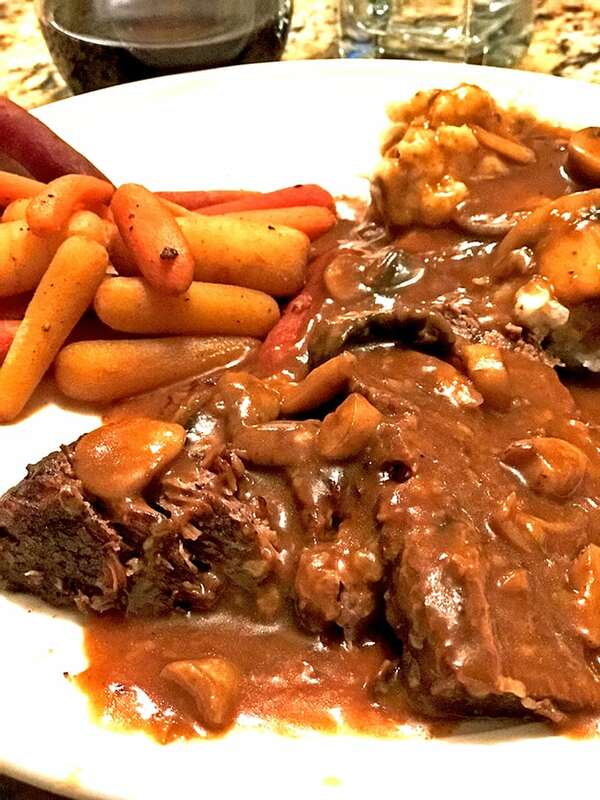 I made this last week and it was the best pot roast my husband and I ever ate! The brown sugar is genius! I made a flour and water roux and that made the grave so rich and yummy with the fresh mushrooms. Making it again tonight. Thanks so much. Thanks for the great feedback, Emily! 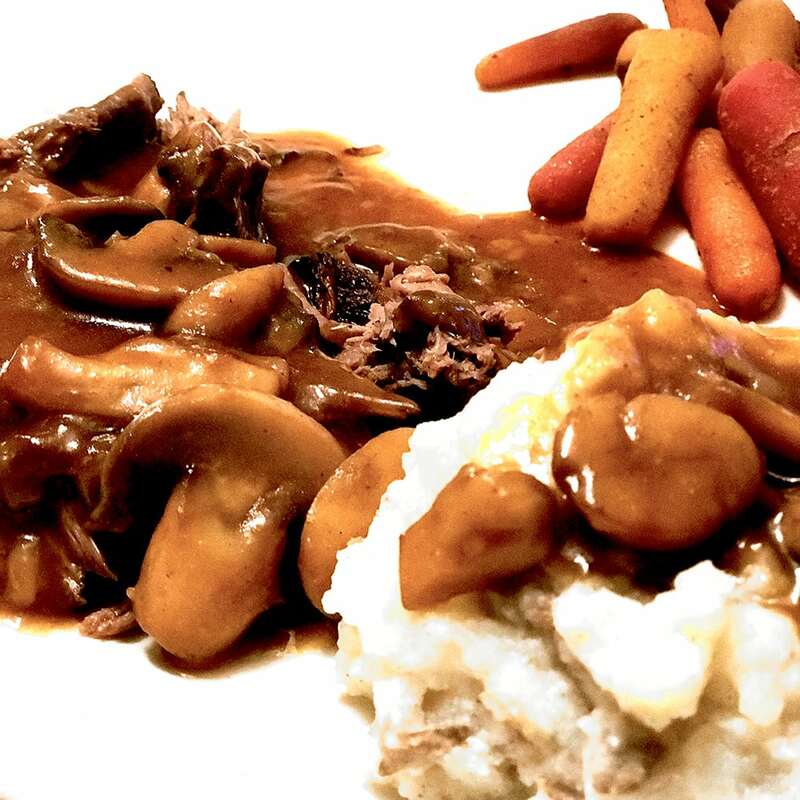 We’re happy that you enjoyed this Instant Pot Roast! Do you think this recipe could be done in a slow cooker? Absolutely. Just monitor it and adjust the times as necessary. I prefer my carrots and potatoes to be cooked soft. Should I add them at the beginning? Also I like garlic cloves. Yes, however, I would add the garlic at the very end. 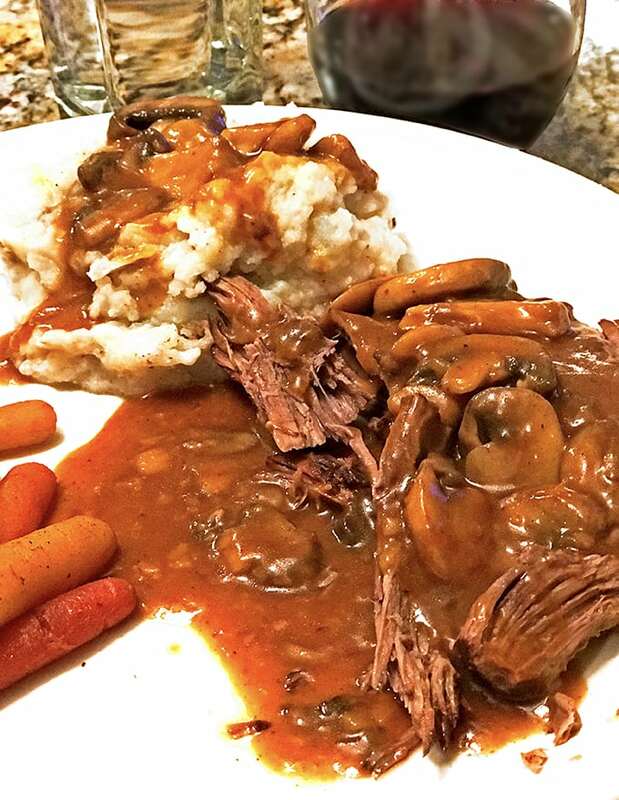 Let us know how this instant pot roast recipe turns out! Do you use the trivot rack thing that came with the instapot?? Hi Keri, no we don’t. This was excellent–I skipped the brown sugar to decrease the carbs, added powdered garlic and red wine and it was fantastic. Thanks so much for posting this. 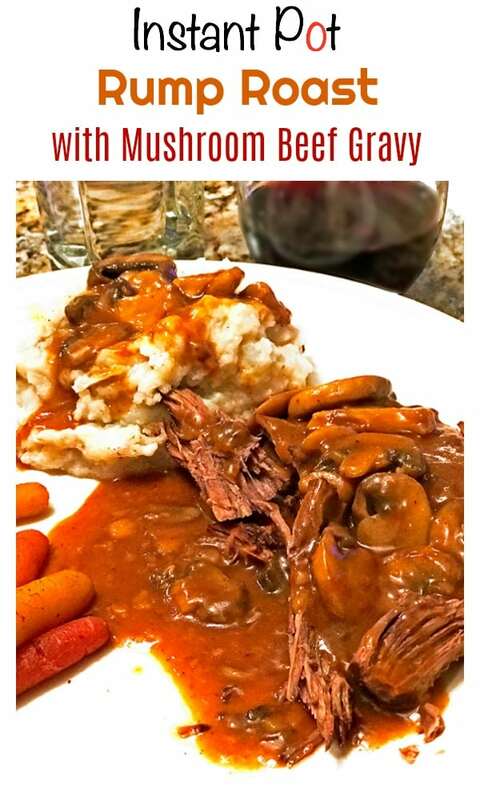 Sounds like you made a delicious instant pot roast! I have a roast that is 4″Lx3″W, would this be 60 or 70 mins? 60 minutes should work well for this size roast. Consider searing it using the sautee function first, to help seal in the juices. Great and easy recipe. Haven’t made rump roast very often but think I’m hooked now. So tender. Was thicker so used more broth. Don’t like mushrooms a lot so sautéd onions and made gravy with broth. Now looking for an fast, easy instant pot chicken and noodle or rice recipe. Good for the cold season. Any suggestions?